Robert Griffith on location during the filming of a project for Elk Hill Residential Treatment and Educational Organization. Robert Griffith is an international award-winning filmmaker who has been telling stories on film and video for more than thirty-five years. 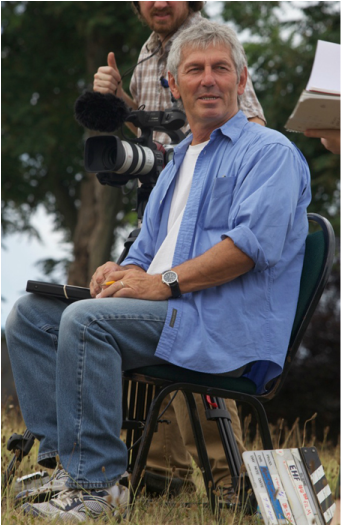 His early training and experience as a documentary and news cameraman for national networks NBC and CBS, led to his forming Griffith Films as an independent filmmaker, creating films and television commercials for regional and national clients. For the last decade, Griffith has concentrated on producing long-format documentaries focusing on a variety of compelling social issues. His latest recognition was being awarded the Theresa Pollak Prize for Excellence in the Arts, in the category of Film. Recent documentaries include Seasons With Brian and Julia, which has been screened coast to coast, and Voices of Hope and Recovery, currently being viewed nationwide. Griffith has won multiple awards, including First Place in the Association of Film Commissioners International Competition in 2006, for Moviemaking in Virginia: Part 2. Griffith served as Director of Photography for the feature length film Lillian, which won a Sundance Film Festival Special Jury Award.